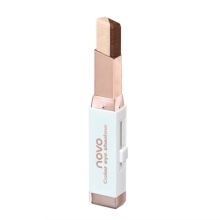 A wonderful combination with 2 colors, helps you create beautiful eyeshadow easily and quickly. Waterproof, long-lasting and skin-friendly, does no harm to your eye skin, fits for all skin types. Square shape eyeshadow head, good for you to draw professional eye makeup. Suitable for daily makeup and party makeup, making you more outstanding. Button design, provides more convenience to your daily use.